Novelty items don't have to be useless. At Promotion Pros, we believe that novel and useful can go hand in hand, which is why we've developed a wide range of custom tools and toolkits. Try out our jumbo screwdriver with button top for those hard-working, DIY types. If your preferences are more automotive based, our company logo novelties such as the mini tire guage keychain will be right up your alley. Want something really functional for your handy customers? The Metal Multi-Function Pliers with Tools and Flashlight in Case can service non-operational machinery and equipment while promoting your brand. 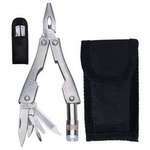 It contains needle nose pliers, a wire cutter, and a Phillips/Flat head screwdriver. Fix anything, anywhere on the go with this Mini Screwdriver Kit. This extremely handy tool comes with small and large size bits and Philips head bits for different sizes of screws. 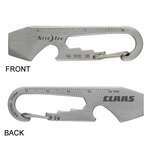 This Doohickey Carabiner Multi Tool is the ultimate useful companion for small repairs. Employees and clients will love showing off your logo when using this handy tool. 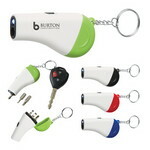 Combine utility and brand promotion by using the Tool and Light Key Chain as a powerful giveaway, to a large number of existing and potential customers. 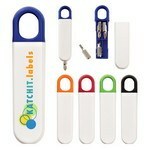 Imprint your company’s logo on this cost effective tool, to enhance your brand’s image.